Fronto famously wrote that "during the most terrible war against the Gauls, Caesar composed various military works, but also two most scrupulous books de analogia, dissertating amid flying javelins over nouns' declensions, words' aspiration and classification, to the sound of war-trumpets" (De bello Parthico 9). Only few fragments survive from De Analogia, and such fragments interest not only linguists: the community of scholars has long since acknowledged the cultural (e.g. Hendrickson 1906), philosophical (e.g. Willi 2010) and political (e.g. Dugan 2005) nature of Caesar's involvement in these linguistic debates, thereby lamenting the lack of an updated edition and commentary of De Analogia. Before the publication of the volume under review, scholars had to rely on Funaioli's Grammaticae Romanae Fragmenta (145-57), which dates to 1907, or on Klotz' edition of Caesar (vol. 3, 177-85), which dates to 1927, and neither one has a commentary. The diligent work of Alessandro Garcea, which is already becoming standard, thus makes a most welcome contribution. A rich introduction is divided into two parts. First De Analogia is located in the context of Caesar's politics and in the cultural debates of his times: Garcea rightly considers Caesar's attempt to standardize the recta consuetudo of speaking Latin (latinitas), based on rationalized grammatical rules, in light of his popularis effort for broadening both people's access to oratory and his own basis of power. 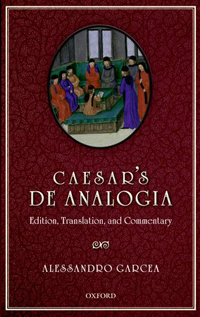 The second part recreates the main terms of the question on Latin language, focusing on Caesar's and Cicero's different views: "Caesar suggests starting from the usage of his own times and using ratio as a tool to increase the communicative power of contemporary Latin" (100); while Cicero has a more restricted understanding of proper Latin, whose "purism is a factor of exclusion and preservation of the elite, rather than a tool for speaking clearly" (101). The third and last part of the volume includes testimonia, fragments (both ordered by topic and translated) and commentary. Garcea's treatment of two fragments will exemplify his method. In what came to be perhaps the most famous fragment of De Analogia, Caesar advises the reader to "avoid, as you would a rock, every unheard and unusual word" (fr. 2). This fragment is reported with slightly different wording by four sources: Garcea lists them much more clearly than Funaioli and Klotz, and he provides an updated and balanced discussion in the commentary, placing the fragment in the context of Cicero's, Varro's and Caesar's views on latinitas, elucidating the meaning of inauditum et insolens and providing a rich and updated bibliography. The nature of the commentary is somewhat unusual, as it reads like an essay structured with paragraphs and footnotes; at times one might feel such essays could have been a bit shorter, but their clarity and thoroughness repay reading. In another fragment (3) the grammarian Pompeius reports that according to Caesar the Roman alphabet originally had only eleven letters. This statement is problematic, and editors have suggested correcting XI in XVI or XXI: Garcea sets out to explain the transmitted text in light of the debate on writing of the end of the Republic. According to Varro there were 17 letters necessary for writing Latin, but only 16 were original (and derived from the Greek alphabet), and this view became standard. Garcea suggests that Caesar and Varro held the same opinion, but Caesar discussed separately the 5 vowels and the 11 (original) consonants. The commentary includes an overview on the origin of Latin letters and their relation to the Greek alphabet (possibly via the Etruscans), conveniently listing both ancient sources and modern scholarly views. Two tables offer a useful synopsis on the origin and development of the Latin alphabet: they list the ancient sources, specifying the number of the original and non-original letters. The commentary includes other tables of this type, bringing clarity to complex discussions and providing the readers with expedient overviews. The volume is capped by an impressive bibliography (33 pages), a concordance comparing the numbering of the fragments by Funaioli, Klotz and Gercea and two indexes: one lists the sources with their sigla, and a general index includes Greek, Latin and English terms together with the quoted or discussed passages. Garcea has thus succeeded in making the fragments of De Analogia more available and especially in providing the readers with a solid and clear explanation and contextualization of the fragments. This volume advances not only our understanding of Caesar the linguist, considered within the end-of-the-Republic debate about pure diction, but it also restores Caesar's place within the tradition and evolution of Latin language and grammar. One may question Garcea's treatment of Cicero. Garcea has a good ear for echoes, signaling how various authors (often polemically) engage with each others' views; in particular Garcea puts Caesar's stance on latinitas in dialogue with Cicero's De Oratore (especially 53-66), Orator (especially 42-6) and Brutus (especially 66-76). No one would dispute that Cicero provides a convenient foil for appreciating Caesar's linguistic views, but at times Cicero is treated a bit too monolithically and the terms of the debate risk being too polarized. Specifically, Cicero's attitude toward Caesar changed dramatically over time: Cicero's letters demonstrate that he was charmed by Caesar around 55 BC, when his brother Quintus was serving under Caesar, and that at that time he enjoyed exchanging short poems and ideas about culture and literature with Caesar; things changed dramatically after the civil war, and by the time of the Orator and of the Brutus their relationship had grown cold. Equally, in the dialogues Cicero often has speakers present different views, arguing for the plausibility of a position, but not necessarily expressing his own views: this should caution from identifying Cicero with the character of Crassus or of Atticus. These remarks, however, must remain isolated, without taking away from the precious achievement by Garcea: he should be commended for producing a useful and much needed edition, which successfully frames the few fragments surviving from De Analogia within the political and cultural contexts of the end of the republic and within contemporary scholarly debates. His work is thus of value not only to linguists, but should be consulted by a vast array of scholars.